Saturday, Nov. 24, 7 pm: “Experience of Pennsylvania Mennonite Conscientious Objectors in World War I” by Duane Kauffman. Saturday, Nov. 24, 8 pm: “Doing Their Duty: the experience of area Mennonite and Brethren boys who accepted military service in World War I” by Joel Alderfer. 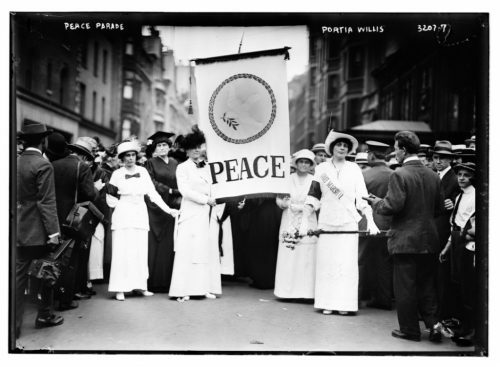 Sunday, Feb. 10, 2 pm: “Women Pacifists and Their Response to World War I” by Anne Yoder. The exhibit will open for viewing after Ms. Yoder’s program. This traveling exhibit from Kauffman Museum, North Newton, KS remembers the witness of peace-minded people against the First World War 1914-1918. This witness included men and women, religious believers and secular humanitarians, political protesters and sectarian separatists. They resisted U.S. involvement in the war, the enactment of military conscription, the war bond drives, and the denial of freedom of speech under the Espionage and Sedition Acts. For this resistance many suffered community humiliation, federal imprisonment, and mob violence at the hands of a war-crusading American public. This exhibit lifts up the prophetic insights and the personal courage of World War I peace protesters, and suggests parallels to the culture of war and violence in our world today. A collaborative team of historians and museum professionals developed Voices of Conscience at Kauffman Museum. The exhibit is based on Kauffman Museum’s 30 years of experience in designing and building award-winning projects with a specific focus on innovative approaches to traveling exhibits. The Mennonite Heritage Center’s presentation of this exhibit is sponsored by the Franconia Mennonite Church Barnabas Fund. $7.00 suggested admission (no charge for MHC members and children under 12). There is handicap access to exhibits. Special tours can be scheduled. Call 215-256-3020.